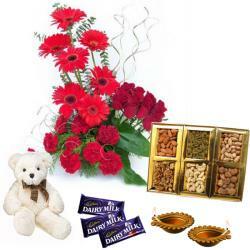 Product Consist : Bouquet of 12 Red Roses,1/2 Kg Black Forest Cake, 3 Kg Seasonal Mix Fresh Fruits in Basket and Box of Assorted Dryfruits (Weight : 500Gms) along with Diwali Fire Crackers (Worth Rs. 300/-) (Note: Firecracker will be deliver as per their availability no specific choice for it). 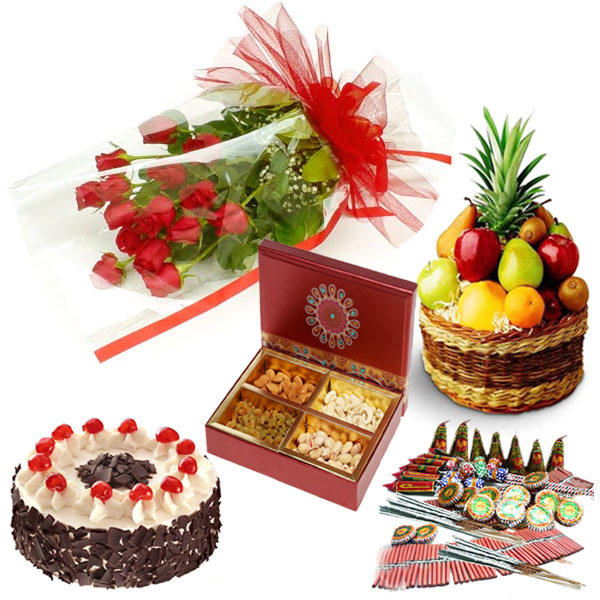 we have brings to you this incredible diwali gift hamper which contains all the items that are needed for an exciting Diwali celebration. 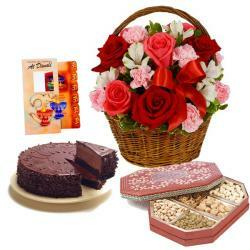 Bouquet of Red Roses along with the Diwali Fire crackers this hamper also contains delicious Black forest cake and a Basket filled with juicy and fresh mix seasonal fruits. The box has four compartments and each one of them is filled with almonds, raisins, cashew nuts and pistachios respectively. 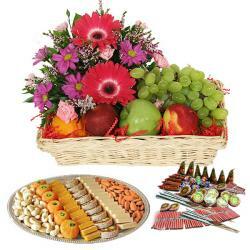 This special hamper is bound to make your loved ones feel special. 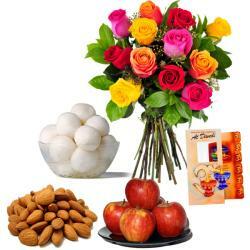 Product Includes : Bouquet of 12 Red Roses,1/2 Kg Black Forest Cake, 3 Kg Seasonal Mix Fresh Fruits in Basket and Box of Assorted Dryfruits (Weight : 500Gms) along with Diwali Fire Crackers (Worth Rs. 300/-) (Note: Firecracker will be deliver as per their availability no specific choice for it).